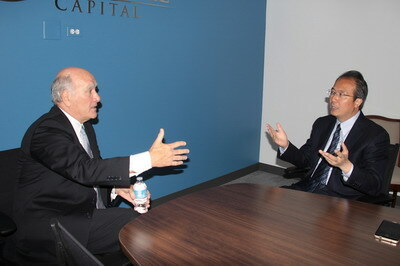 On October 11, Consul General Hong Lei met with former U.S. Secretary of Commerce William Daley in Chicago. Consul General Hong Lei said that after visiting all the nine states in the consular district since assuming office, he is glad to see the relationship between China and the U.S. Midwest enjoys a remarkable boom with fruitful exchanges and cooperation in economy, trade, culture, education and other areas. China has become an important partner of the nine states. Chinese enterprises have created nearly 30,000 jobs for the local communities. 70,000 Chinese students are studying in colleges and universities in the Midwest. There are 19 Confucius Institutes in the consular district and over 19,000 students are learning Chinese in Chicago Public Schools alone. Consul General Hong Lei said that the day before yesterday, he was in Chinatown for the 2016 Chicago Marathon and there were record-setting 555 Chinese runners, which is the largest number of Chinese participants in history and the second largest foreign group in this year's event, only after Mexico. This example vividly demonstrates how close China-U.S. exchanges have become. It is even more gratifying that people from all circles in the nine states expressed their hope to further strengthen exchanges and cooperation with China. The Chinese side hopes that Secretary Daley could play a positive role and continue to contribute to the stable and healthy development of China-US relations. Secretary Daley welcomed Consul General Hong Lei to Chicago. He said that in recent years, U.S.-China relationship has indeed made great progress. Compared with the 1990s when he served as Secretary of Commerce, the bilateral relations have become more mature and the interests are more integrated. Despite some differences, cooperation has always been the core of U.S.-China relationship. More than 10 years ago, his brother, former Chicago Mayor Richard Daley advocated Chinese language classes in Chicago Public Schools and he was proud that there are more students learning Chinese in CPS than any other public school system in the U.S, including San Francisco. The two countries should further develop all-round exchanges and cooperation like this.